Confidently navigate your JMP® Scripting Language journey with this example-driven guide! 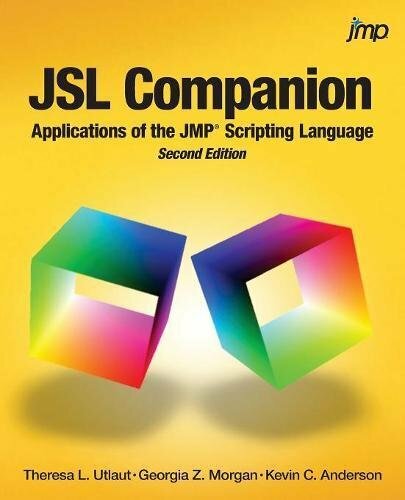 With more than 200 example scripts and applications, JSL Companion: Applications of the JMP® Scripting Language, Second Edition provides scripters with a resource that takes them beyond the basics of the JMP Scripting Language (JSL) and serves as a companion to writing applications. Avid JSL scripters Theresa L. Utlaut, Georgia Z. Morgan, and Kevin C. Anderson have tapped their expertise to write a task-oriented approach that allows readers to learn scripting by immersion. This edition builds on the earlier edition with substantial new content for scripting enhanced JMP features, such as Graph Builder, new query methods, and enriched display box functionality. A new chapter is dedicated to creating applications with the Add-In Builder and Application Builder. The “Know Your Tools” topic has been expanded, including a section on how to use the JMP Debugger. The book begins with an introduction that is intended for the JSL novice and quickly moves into the building blocks of JSL, which include input and output, working with data tables, script-writing essentials, and JMP data structures. The next chapters provide the foundation for building an application and focus on creating reports, communicating with users, customizing displays, and writing flexible scripts. The final chapters include building and deploying applications and helpful tips on planning scripts, debugging, and improving performance.